Missouri Education Watchdog: Head Start and Universal Preschool: No Great ROI? On Wednesday, The Center for American Progress released their proposal to increase funding for the already failing Head Start Project. The progessive thinktank is lobbying to increase funding from 7,200 dollars per student to 10,000 dollars per student. 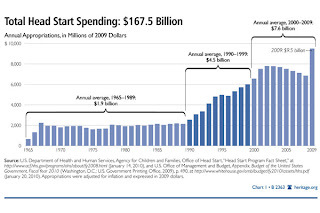 That’s nearly 40 percent more than what we're spending now. What are the facts and data about Head Start? In summary, there were initial positive impacts from having access to Head Start, but by the end of 3rd grade there were very few impacts found for either cohort in any of the four domains of cognitive, social-emotional, health and parenting practices. There is clear evidence that Head Start had a statistically significant impact on children’s language and literacy development while children were in Head Start... However, these early effects dissipated in elementary school, with only a single impact remaining at the end of 3rd grade for children in each age cohort: a favorable impact for the 4-year-old cohort (ECLS-K Reading) and an unfavorable impact for the 3-yearold cohort (grade promotion). That means spending almost 40 percent more per participant to leave our children’s circumstances unchanged or even worse than when they when they first entered school. You can read more of the article here and the complete Head Start study here. We wrote about Head Start and the push for universal preschool previously and it is worth an reread. Taxpayers need to be ready for their school boards when the preschool plan is unveiled in the next bond issue and the cry goes out, once again, that it's "for the children" and "educational equity". Ask your board members and superintendents to show you the research that district kindergarten children have outperformed those students not attending kindergarten. Ask them to read the Head Start report and provide data for their proposals. If these education reformers are so keen on being data driven and require 50% of teacher evaluations be based on student data, then they should be more than happy and provide the data you request so you can make an informed decision to fund a seemingly failing blueprint for education. Taking a completely different approach to question the effectiveness of Pre-K, Rachel Ryan of the Huffington Post describes the effect of children who are prematurely separated from their mothers. A study released by the National Institute of Child Health and Human Development found that the "more time children spent in child care from birth to age four-and-a-half... the less likely [they were] to get along with others, as more assertive, as disobedient, and as aggressive."